Construction continues on the containment unit for Unit 3 at Plant Vogtle in Waynesboro, Ga. Georgia Power Co. The Energy Department is considering a fast-tracked timeline for the repayment of billions of dollars of federal loans to a troubled nuclear expansion in Georgia as speculation mounts that its developers could pull out of the project today. Senior DOE officials told reporters on an 8 p.m. conference call yesterday that the agency can require utilities building Plant Vogtle about 30 miles south of Augusta to repay billions of dollars in conditional loans either immediately or within the next five years. The conference call came the night before a deadline for Vogtle's owners to decide individually whether they want to finish the reactors. Georgia Power Co., Oglethorpe Power Corp., the Municipal Electric Authority of Georgia (MEAG) and Dalton Utilities are building the reactors, the first such project in the United States in more than 30 years. Vogtle Units 3 and 4, the country's lone nuclear construction projects, are years behind schedule and billions of dollars over budget. The companies have received billions of dollars in loan guarantees and will have 25 years to repay the money if they move forward, as is currently the case. But DOE officials said they could require Georgia Power and Oglethorpe to pay back $5.6 billion of $8.3 billion in loans within five years under an accelerated timeline should the project be scrapped. DOE could decide to treat MEAG differently. The nonprofit regional power authority is under legal and public pressure from JEA — the Jacksonville, Fla., electric company — to walk away from the project. JEA recently sued MEAG to get out of its long-term contract to buy some of the electricity from Vogtle once the reactors are finished. MEAG immediately countersued. DOE already halted payments for the project in March 2017 after Vogtle's main contractor, Westinghouse Electric Co. LLC, declared bankruptcy. But concern at the agency about Vogtle's future peaked after JEA's actions. MEAG has scheduled a special board meeting for 2 p.m. today. JEA is pressuring the board legally and publicly to pull out of the project. If MEAG votes to cancel the project, DOE officials could require the utility to pay back $1.8 billion immediately. DOE officials last night denied that the warnings about faster repayment — laid out in three letters to developers late last week — are meant to pressure the companies into building Vogtle Units 3 and 4. The intent, they said, is to ensure that the public understands DOE's position and the agency's obligations to protect taxpayers. And agency officials said they want to emphasize the intent of the federal loan program, namely to foster new energy technology and cut emissions. DOE warned in the letters that any decision to scrap the project could have far-reaching implications for the United States' energy independence and its economy. "The decision each owner makes should be made with an understanding of the ripple effect this project is already having, including job creation and the positive signal of the continued value and viability of commercial nuclear power in our country," wrote John Sneed, the head of DOE's Loan Programs Office. Public power companies that are partners in Southern Co.'s Plant Vogtle expansion project must decide today whether they want to continue building the reactors, whose budget has jumped another $2.3 billion in less than a year. The reactors hung in the balance last year after Vogtle's main contractor filed for bankruptcy protection. All four partners agreed to go forward under a new arrangement and structure that put Southern's nuclear unit and Southern's Georgia Power in charge. Vogtle's future is murky again because the costs have risen more than $1 billion and because Georgia Power wants to absorb its share of the increase instead of asking to recoup the costs from customers. Both have triggered a requirement for the other owners to reassess and decide whether they want to finish the reactors. Dalton Utilities, which owns the smallest percentage, has already agreed to keep going. That leaves Oglethorpe Power Corp. and MEAG to decide by today. Together they own 52.7 percent of the project. Oglethorpe Power Corp. is not required to disclose publicly when its board will meet and has not done so. 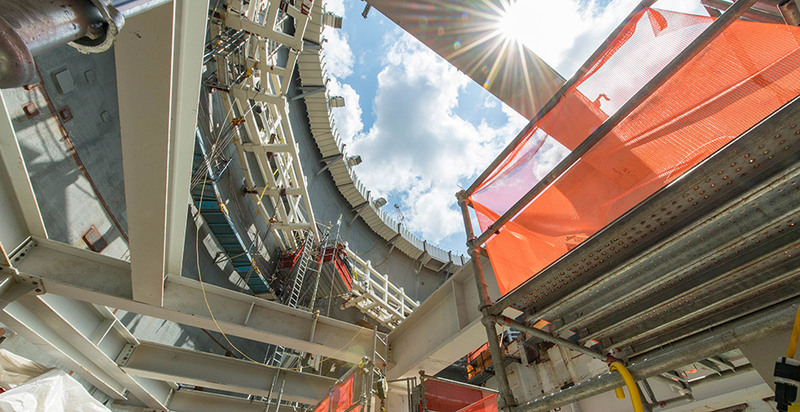 Vogtle started out 10 years ago as a project with a $14 billion price tag that would be finished in 2016 and 2017. By last August, those costs had ballooned to $23 billion, and the reactors had new deadlines of November 2021 and 2022. That new tally included a $3.7 billion contribution from Toshiba Corp., which owned Westinghouse at the time. Georgia Power presented the new figures to the state Public Service Commission along with a caveat from all of the partners: Regulators must ensure that the electric company could recoup its share of the new costs from its customers. If that didn't happen, then any of the public power companies could pull out of the project, and Vogtle would fail. The agreement was in part because the utilities no longer had the benefit of a fixed price contract with Westinghouse, one that ultimately drove the contractor to bankruptcy. Without that type of a cost cap, the public power utilities worried over passing along increased costs to their customers. They do not have shareholders who could absorb any of the new expenses. The controversial new setup drew the ire of some commissioners. The PSC ultimately signed off on Vogtle's future but placed some financial constraints on Georgia Power if the reactors did not meet the new deadlines. Southern disclosed $2.3 billion in new costs as part of its quarterly earnings announcement in August. The cost increases are in part from expanding the scope of work by Bechtel Corp., another key contractor, and Southern Nuclear to ensure they can finish the reactors on time. Financial analysts immediately pressured Southern's CEO for assurance that the costs would not rise again. That is something that is virtually impossible to do given the size and complex nature of building nuclear reactors, which must adhere to strict safety and regulatory standards. What's more, Georgia Power has been vocal about having trouble hiring enough craft workers to meet aggressive productivity timelines. That is key to keeping the project on track to finish by its new deadlines. The public power companies have not spoken publicly about Vogtle since August, but a group of Georgia lawmakers last week released a letter calling for a cost cap. The bipartisan group of 20 lawmakers said Georgia Power's recent decision to absorb Vogtle's new price increase was unfair to Oglethorpe and MEAG. Georgia Gov. Nathan Deal (R) also sent four separate letters to each of the owners, applying equal pressure to go forward. "Walking away at this point would be breaking our promise," Deal wrote. Capping the costs means Georgia Power or Southern would have to agree to absorb not only their share of the increased costs but that of one or more of the co-owners. Any one of the public power companies also could decide to walk away. All of the owners are in a strange game of tug of war, highlighting nuclear's chief issue, which is cost. The utilities have argued for years that finishing Vogtle would mean emission-free baseload generation on the grid for decades. Finishing Vogtle also would give Georgia Power, the PSC and others bragging rights to say they shepherded the reactors through a host of vendor problems, contractor changes, a bankruptcy and other tense moments. It's unclear what will win out: economics or electricity, politics and emotions. A wide variety of consumer groups, environmentalists and at least one PSC candidate for the November election have capitalized on today's decision, especially in light of JEA's actions, which include taking out full-page newspaper ads and placing a billboard on a busy highway. One analyst asked Southern's CEO, Tom Fanning, in August what it would mean if one of the co-owners voted not to continue with Vogtle. Fanning said the project would be canceled, technically. "And then, of course, you could take a variety of different paths beyond that. ... Then you have to figure out how or whether to proceed beyond that," Fanning said. "There is no prescription per se beyond that action," he said. "Of course, we could all negotiate whatever, but that would also require Public Service Commission approval and a variety of other things."